The Shrewsbury Volunteer Fire Company has served the citizens of southern York County with fire and rescue services for over 70 years. This was possible only through the hard work and dedication of its members, the Ladies Auxiliary and the community as a whole. It was through this hard work and dedication that the Shrewsbury Volunteer Fire Company has grown and developed from its humble roots to what it is today. 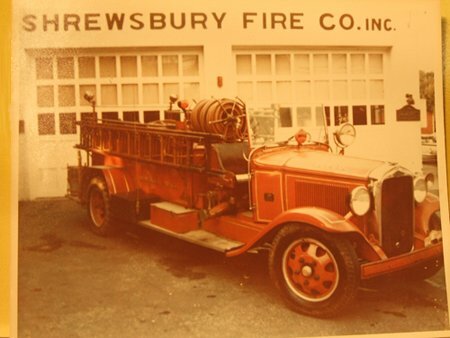 Prior to the formation of the fire company, Shrewsbury Borough handled fire fighting operations. After incorporation in 1834, the borough council saw a need for fire protection. They purchased a hand cart, built in 1780, called the "Dart". There was limited fire protection offered other than buckets and the town pumps. The Borough took further steps to provide fire protection in 1876, when the chief burgess appointed a fire committee, consisting of Joseph Raffensburger, John Keller, and Bernard Rupert, to maintain the engine and oversee fire operations. On September 30, 1878 the commitee had the "Dart" greased, packed and installed a metallic box on to hold water. The same month, five men were appointed as the town firemen: Cornelius Beck, Samuel Giesey, George Koller, Archibald Daily, and Isaac Folkemmer. In 1880, after a fire in the engine house, a committee was appointed to find a suitable place to build a new engine house. A lease was obtained from Mary M. Myers for her lot on Forest Avenue for 99 years at $1.00 per year. The specifications for the building included that it was to be made of brick with a slate roof, one story, but not less than twelve feet high. It was also decided to purchase an additional handcart from Laurel Fire Company in York at a cost of $100. This new handcart was dubbed the "Laurel". Unfortunately, these efforts did little to save lives or property in the town. 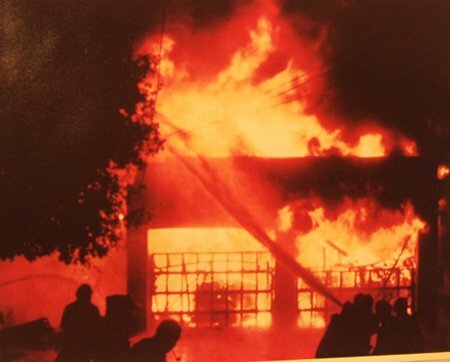 On April 1, 1881, the back buildings of the Meyer's property were destroyed by fire. Later that year, Mary Wallick burned to death in a house fire. Another fire leveled the buildings owned by the Methodist parsonage in 1882. In 1884, Catherine Shewell was killed by a fire when Charles Wagner's barn and its contents caught fire on Christmas morning. There was little doubt that greater fire protection was needed. However, it was not until the 1930's that steps were taken to form a fire company. A meeting was held by citizens to discuss the importance of forming a fire company to save both lives and property in the community. A second meeting was held April 17, 1931 at the Trail Theater. Four officers were elected at this meeting to oversee the formation of the company: President, Dr. Paul Shaub; Vice-President, Bender Herr; Secretary, Paul A Sechrist; Treasurer, Roy Stover. A decision was made to begin selling memberships for$1.00 to join and $1.00 per year thereafter. At a third meeting on May 25, 1931, the company discussed the purchase of an engine. A picnic was held to raise money to buy an engine and pay the various bills of the fledgling fire company. The picnic was the forerunner of what is now the fire company's annual carnival. Among the committees formed for the picnic were the parade committee with Thomas Singer and George Klinefelter in charge, and the ice cream, candy, and soda committee with Joseph Johnson and G. F. Klinefelter chairing. At the September 8, 1931 meeting, the Secretary was requested to write several fire apparatus companies for prices on 500 gallon capacity engines. Also, the "Laurel" and the"Dart" were tested at the fire plug on East Forrest Ave. In November, the company purchased two chemical engines. These chemical engines worked on the same principal as a soda-acid extinguisher. They consisted of a large container on a two wheeled cart that was filled with acid and baking soda. When turned upside down, they built up pressure to propel the water. On September 11, 1933, the company appointed a five-man committee, consisting of Dr. C. H. Garry, Dr. Shaub, Walter Klinefelter, G. F. Klinefelter, and M. E. Bricker to investigate the prospect of buying a new engine. On November 2, 1933, they unanimously agreed to recommend Buffalo Fire Apparatus's 1932 Reo with a 500 gallon capacity tank. They delivered their recommendations at a public meeting on November 3, 1933. Dr. G. F. Stover made the motion to purchase the engine for $3500. 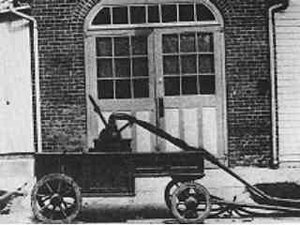 The vote was to purchase the fire company's first engine was unanimous. On November 13, 1933, the company was officially organized and the officers were elected. The officers were: President, Dr. Paul Shaub; Vice-President, Bender Herr; Secretary, R. A. Sechrist; Treasurer, Roy Stover; Chief, G. F. Klinefelter; Assistant Chief, G. H. Klinefelter; Hose Director, Elmo Folkemoer; Pipe Man, Stewart Renoll; Truck Driver, Walter Klinefelter; Chaplain, Rev. Kline; Trustees, Dr. Gerry, M. E. Bricker & Frank Attig. In January 1934, the company decided to take a loan of $1480 from the Drovers & Mechanics Bank of York and to pay the balance of $1950 on the Reo. A Fireman's Relief fund was begun on March 26, 1934 with the Fireman's Relief Association of Pennsylvania. The object of the Relief Association is to provide protective benefits to its members and families in the event of death, sickness, and temporary or permanent injury caused by accident. Various activities were held in 1934 to raise money. These activities included picnics at the playground and a carnival on May 25-26th at Henry Grove's carriage house. Some of the funds from these activities were used to purchase a much-needed house siren. Prior to the installation of the siren in December, 1934, a firefighter would ring the bell atop the engine house to sound the alarm. Since the bell was not very loud and an inconvenience, a new siren from the Federal Electric Company of Chicago was installed at a cost of $430. Regular tests were scheduled for Saturday at noon. A system was established whereby two blasts would mean a test, four blasts would mean a fire in the township, while eight blasts indicated there was a fire in the Borough. Since the engine house built in 1880 was barely large enough to house the Reo, the company began to consider building a new engine house. A committee was formed to investigate the purchase of Henry Grove's carriage house for this purpose. By this time, the "Dart" and the "Laurel" had been moved to Dr. Gerry's barn for storage. In the early 1940's, both carts were lost when the barn was destroyed by fire. On April 1, 1946, the Shrewsbury Fire Company lowered the age requirement for membership from twenty-one years of age to eighteen. Later that year, the fire company once again began to consider building a new engine house. On October 7, 1946 a building committee was appointed which included:W. M. Deffendall, W. C. Anstine, Charles List, Clarence Sterner, and Dr. Stover. By April 1947, most members were in favor of building a new engine house. Mr. Buchart, an architect from York, presented his plans for the proposed building to the members. While the plans were being revised, the company considered possible location for the new engine house. They considered the recently acquired John Wagner property and the Grove property, which had been previously acquired, as possible building sites. The vote was twenty in favor of the Grove property to four in favor of the Wagner lot. Once the plans were ready and the location was determined, the blueprints were sent to the state for approval. After being approved by the state, excavation was begun in August of 1948. Due to the expense of the new building, a soliciting committee was formed to obtain more funds. The members of the committee were Charles Messerschmidt, Clarence Sterner, Harry Bonner, Richard Duerr, Charles Sweeny, Harvey Godfrey, Jr., George M Shilke, Claude Walker, Harvey Godfrey, Sr., Earl Taylor, and Truman Allison. Insurance was obtained for the building in March of 1949, and the decision was made to dedicate the building to WWI and WWII veterans. On the Saturday after the dedication, August 1, 1949 a fire broke out in the bathrooms of the hall causing $1000 in damage. Luckily, Harold Schaefer,aged 14 at the time (now a Shrewsbury Fire Company Life Member) discovered the fire and turned in the alarm. Damage was limited to the bathrooms. Having completed the new engine house, the fire company began to consider purchasing another fire engine. On August 4, 1952 a motion was made by Norman Rohrbaugh and seconded by Clarence Sterner to investigate the purchase of a new engine. A committee consisting of Clarence Sterner, Claude Walker, Norm Rohrbaugh, Preston Allison, and Clarence Wolf was appointed for this task. In October 1952, the Ladies Auxiliary graciously donated a panel service truck. The following November, with a motion from Norm Rohrbaugh and a second from Clarence Wolf, the company placed an order for a F.W.D., model 75T engine with a 500 gallon booster tank, two booster reels, closed cab and heater. On July 13, 1953 the company voted to borrow $12,000 for the new F.W.D. Within a year the company had expanded from a single engine company to having three pieces of apparatus. On December 8, 1958, with a motion from Clarence Sterner and a second by Norm Rohrbaugh, the company voted to have the fire chief investigate the purchase of a new tank truck. Despite the tremendous financial burden of paying off the F. W. D., the building and the various other bills, a committee was appointed at the January meeting to look into the purchase of a tank truck. This committee consisted of Clarence Sterner, Harry Borner, Charles Sweeney and Clarence Wolf. At the February meeting, the committee reported the tank truck had been ordered from the Memphis Equipment Corporation for $1783.50. Delivery was expected by March 1st, but it would further work to repair the tank truck and get it into service. By 1961, the panel truck donated by the Ladies Auxiliary was beginning to wear out and another service truck was needed. A vote was made to trade the truck for a new Chevy Step Van. Also, it was decided to replace the Reo and F. W. D. which were rapidly becoming obsolete. In 1964, a new 1963 John Bean pumper was purchased for $22,000. These purchases made the engine room entirely too crowded. The engine room became so crowded that the Reo had to be parked in the middle of the room. In 1970, the company decided to expand the engine house again. In November, they bought the lot next to the building with the hope of using it to enlarge the engine room. Since the Reo was no longer needed, it was sold to Benjamin Ford for $610. In September of 1971, a committee consisting of Harold Schaefer, Clarence Sterner, Norm Rohrbaugh, and Carl Daehnke, was formed to find a new tank truck to replace the old G. M. C. On January 10, 1972, a motion was made by Robert Sweeney with a second from Dennis Wertz to purchase a milk truck from M. L. Lentz to convert into a tanker. The truck, a 1963 Ford, cost $9400 with all repair costs included. Once again, the Ladies Auxiliary assisted the fire company by paying $4000 toward the truck. Later that year, on September 27, 1972, disaster struck again when an explosion and fire of suspicious origin began in the engine room. Although Clarence Sterner and others attempted to remove the equipment, the equipment became trapped inside by two I-beams that had collapsed on top of them. The New Freedom Fire Company and others arrived quickly to assist Shrewsbury, but the engine room and its contents were a complete loss. Fortunately, the hall was saved. Working quickly, the fire company was able to obtain a new F. M. C. by that evening. Harold Schaefer and Harry Bonner traveled to Reading and brought the new engine back to Shrewsbury. The community, other firefighters, and the Ladies Auxiliary were all very gracious with gifts of equipment. Littlestown Fire Company loaned a 1946 American LaFrance pumper and Parkville Fire Company donated a 1953 G.M.C. tank truck. The financial burden was tremendous, The York County Co-Operative Firefighting Association came to Shrewsbury with ideas for fund-raisers. Many fire companies, organizations, businesses, and individuals donated money to rebuild the engine room and get the fire company back on its feet. Over $160,000 dollars was spent trying to recover from the fire. Not only did the engine room require replacment, but the destroyed trucks had to be replaced as well. The company decided to replace the van that burned in the fire with a new rescue truck. A committee composed of George Shilke, Dennis Wertz, Robert Sweeny, Richard Mummert, and Carl Daehnke drew up plans and sent them to the Lancaster Auto Spring Company, who delivered the truck in October of 1973 at a cost of $20,000. Once again, the Ladies Auxiliary helped the fire company by purchasing the new rescue truck. This help could not have come at a better time considering the financial burden of the company. When the engine room was finished, new bathrooms and a heating system were installed, and the hall and lounge were panelled. On June 8, 1974, the company rededicated the new engine house "In Grateful Memory to the men and women from the community who served in the armed forces of the United States in any wars". The new engine house was considerably larger than its predecessor. That same year, a new F.M.C was ordered and arrived in the fall. As the call volume began to increase, a John Bean High Pressure attack truck was ordered in 1978. The G.M.C. was sold and the LaFrance was returned to Littlestown. In 1981, the fire company purchased their last F.M.C. Also, that year, they broke new ground by being one of the first companies to buy a Hurst Hydraulic rescue tool. In 1992, both 1970's F.M.C. 's were replaced with a Spartan/EEI engine. The Dodge Attack Truck was replaced by a Ford brush truck in 1994. In 1994, the 1981 F.M.C. was replaced with another Spartan/EEI engine. In 2001, the 1994 Ford brush truck was replaced by a 2001 Ford F-450. The company salvaged the pump, tank and hose trays for use in the new brush truck. The 1994 brush truck was relegated to work as the company's utility truck which was needed for fundraisers, training exercises, fire police and transportation to meetings. The Southern Regional Police Department donated a used, Ford police crusier, to our department which served as the duty officer car until 2006 when it was replaced by a 2007 Ford Expedition. A state grant was obtained to assist funding of this vehicle. In 2004, the company took delivery a Spartan/Kenco Heavy Rescue Truck, dubbed "Squadzilla" after the fictional monster of the science fiction movies. At a length of forty feet and with enough space for auto, confined space, trench, rope, structural collapse and water rescue equipment, "Squadzilla" embodies the rescue culture of the Shrewsbury Volunteer Fire Company. This new equipment is state of the art and is a far cry from the hand drawn equipment and the 1932 Reo. This transition from the hand carts to the modern equipment that the company has today would not be possible without the hard work of its past and present members, the Ladies Auxiliary, other fire companies, and the Southern York County community as a whole. With their continued help, the Shrewsbury Fire Company will continue to provide fire and rescue services to the residents of the area.